Not interested in Elyria ? Please choose a different community. Our team of caring Skilled Nursing Professionals embraces the value of dignity, honesty, trust, respect and appreciation! Cork Tree Tavern is a wine bar that focuses on a Northern Italian cuisine with a Chef driven menu. Elyria City School District – home to the Elyria Pioneers – serves nearly 7,000 students in a diverse community of 55,000 residents. Elyria is Ohio’s 14th largest city and was founded in 1817 by Herman Ely. It is the birthplace of artists, inventors, historians, engineers, athletes, scientists, health professionals, customer service gurus and world-renowned organizations and corporations. Elyria City Schools enjoys a rich history dating to the early 1800s and laying claim to the first high school west of the Allegheny Mountains, Elyria High School, chartered in 1830. Today, Elyria High School is the district’s flagship school serving 2,000 students, grades 9 through 12. In 2007 residents approved a 3.37-mil bond issue to rebuild Elyria High School. Architects set out to design a fantastic facility to meet today’s teaching and learning needs while preserving the school’s rich history. Voters elected to keep the school’s oldest structure, the Washington Building, and see it incorporated into the new high school design. The Washington Building, an imposing sandstone structure quarried from stone in Elyria in 1894, is on the National Registry of historic landmarks. In all of its renovated glory today it is the home to the history department of Elyria High School. 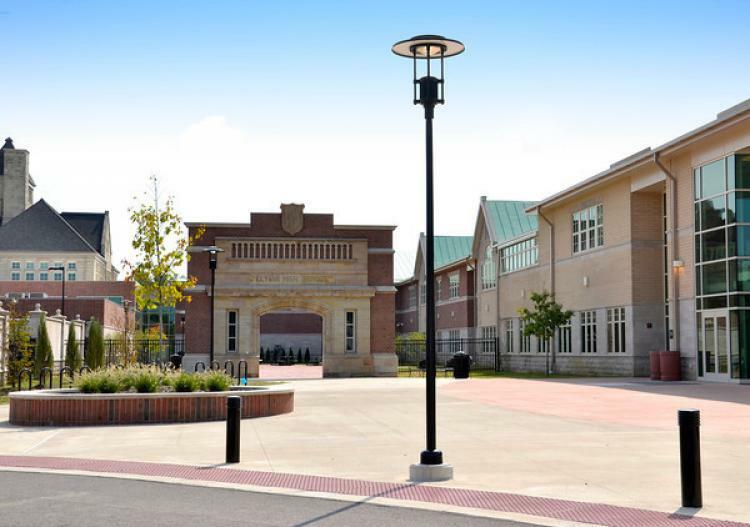 The Washington Building was the architectural inspiration for the design of the new Elyria High School, which opened in grand fashion to the public on June 2, 2012. The modern facility offers the latest, greatest classroom technology, a state-of-the-art media center, a sophisticated music wing with college-style vocal rooms and a beautiful 830-seat theatre for student and professional productions. The athletic facility offers a 2,000-seat competition gymnasium and an 800-seat tournament gym, a wrestling room, therapy room and modern locker and shower facilities. The building is LEED certified with a silver rating. Like the building itself, curricular options at Elyria High School are unmatched. From special needs to general education to advanced, college-level rigor, Elyria High School meets the needs of every student. Character-building and career-enhancing offerings like sports, visual arts, music, drama and clubs are plentiful, and with no participation fees. Elyria City Schools serves its youngest learners in preschool and free, full-day kindergarten. Preschool is located at the Elyria Early Childhood Village, a program that has earned the highest distinction in preschool education, and at Franklin Elementary School. The Franklin Elementary unit while open only to Franklin neighborhood residents offers new-age classroom technology like tablets, SMARTboards, WiFi and modern accoutrements. It is possible thanks to a multi-million dollar, multi-year grant from The Stocker Foundation. Elyria’s kindergartens are located in neighborhood schools across the district and at the Elyria Early Childhood Village. They are taught by highly qualified early education specialists. The district is also home to seven elementary schools serving students in kindergarten through fifth grade, and three middle schools for students in sixth through eighth grade.